Your Favorite Saturday Morning Cartoons + Brunch Cocktails + Free Cereal! One of NYC’s hottest tickets is returning to the Arlington Cinema & Drafthouse for another weekend of cartoon, cereal and brunch cocktail fun! Coming off a seven year, sold-out run in Brooklyn, we’re bringing your favorite childhood cartoons to experience on the big screen while dining on the Drafthouse’s delicious food and drink menu and our free all you can eat sugary cereal bar. Hosted by SecretFormula's Michael Austin and Nell Casey! – Specialty cocktails like “The Sonny,” a White Russian topped with Cocoa Puffs! 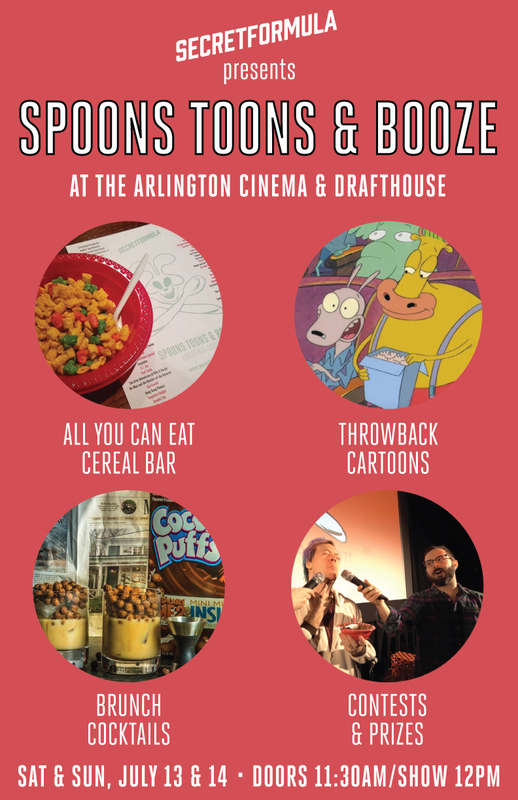 – Compete in onstage contests to choose which cartoons we watch and win retro cartoon- and cereal-themed prizes, plus tickets to Arlington Cinema & Drafthouse! About SecretFormula: We produce, host and throw parties and events all over, but mainly in Brooklyn. Always fun...funny when possible. From group singing dance parties with your favorite music videos subtitled for the whole crowd to sing along with (Sing-Alongs), to cartoon and cereal brunches featured in Time Magazine (Spoons, Toons & Booze), to themed TV and movie parties and lots more we bring the nerdy and nostalgic together for your enjoyment and to bring like minded people together to share their passions IRL. We've been entertaining NYC and leading the charge on the 90's renaissance since 2009...time to experience the secret for yourself.